People have asked me how I have kept my interest alive across a 50 year time span of research? I thought about this again recently and came up with a few ideas which I’d like to share with you. One of my main guiding principles has been, to simply 'follow the facts.' If a UAP case turns out to have a mundane explanation, then I say so! I believe that UAP investigators should weed out as many identified cases as possible, leaving only good quality “unknowns” to work with. I have found this consistency of approach to be invaluable. It can however, lead to differences of opinion with other UFO researchers who have a non-negotiable belief system. One example of this, occurred after I appeared on an ABC television program, which discussed various medical issues. I suggested on the show that some UAP abductions have their roots in terms of 'sleep paralysis.' A well known Victorian UFO researcher took me to task for daring to suggest an alternative explanation to the 'Grays.' I had, after all, only based my opinion on personal research, while his views arose from armchair research. Another example, based on exhaustive research, was my suggestion that the 1988 Mundrabilla car encounter had an alternative non-extraterrestrial explanation. Some American researchers took a dim view of this suggestion, even though they had conducted no first hand investigations. I have now undertaken over thirty cold case reviews of Australian events. Some of these reviews have suggested alternative, mundane explanations, while others have strengthened the possibility of a truly unknown phenomenon. A 12 month joint project with Melbourne based researcher Paul Dean, to collect and examine 12 months worth of Australian sightings. All of these projects developed my knowledge in many areas; made me question various approaches and ended up with me publishing articles across the UAP literature for others to discuss and debate. I read a lot of different books and magazines, and browse the internet frequently. My reading covers diverse topics such as astronomy, biology, physics, the paranormal, mathematics and biographies to name just a few. I find this keeps my mind active. When reading I always try and link the information I come across to UAP research. For example, I once read a book about the search for weapons of mass destruction in Iraq. A portion of a single page mentioned UAP research within the intelligence area of the Australian Department of Defence. This ultimately lead to the release of a formerly secret intelligence file on UAP. This file may now be viewed on the National Archives of Australia website. In my opinion you shouldn’t just study UAP. UAP appear to be part of a much broader area of investigation which we label as the 'paranormal.' In my opinion, much is to be learnt by researching these two topics as one. For example, the after-effects of some UAP close encounters include a range of effects labelled paranormal, such as poltergeist activity. Also, scientific studies on the topic of out-of-body experiences are relevant to abductions. Science has now been able to create OBEs on demand, by stimulating the human brain. It also has, in the laboratory, successfully demonstrated that one’s sense of self can be transferred to a point outside the body. For various research articles see my blog which I maintained on these topics between 2009 and 2014. I’ve taken a number of breaks from researching UAP. I think the longest was for four years. Breaks, particularly long ones, enabled me to escape the day to day routine of UAP investigations. This gave me time to reflect. It was during such breaks that I developed insights into how the fantasy-prone personality, and hypnagogic imagery may relate to UAP. Research Director for UFO Research SA Inc.
Each of these roles brought me into contact with a range of different individuals, and taught me new skills. I would urge you all to run your own website; make documentaries; publish your own blog, or write for UAP magazines. David Jacobs is a US abduction researcher with some controversial viewpoints, some of which I have strongly disagreed with. I have debated some of his ideas in print. Likewise, back in the 1980’s and 90’s I found much to disagree with Whitley Strieber and documented my observations in print, e.g. The International UFO Reporter. Some time ago, my thoughts on former astronaut EdMitchell’s revelations about ETs, even made the pages of the Tehran, Iran daily newspaper! I have outlined my views, in various places, on the inadequate research we have collectively undertaken on the UAP abduction phenomenon. Interestingly, some people in the US and UK have/are following up lines of research suggested, in part by me. Long term blog readers, will also be aware that I proposed an alternate conventional hypothesis for the 6 April 1966 Westall, Victoria, Australia sighting. I pointed out that there is almost no hard data available. There is no analysis of reported ground traces. There is no evidence of radar detection of the object. There are no documents about the sighting to be found in any Australian government file. The witnesses' observations are not well documented from the era, e.g. there are no entries from a 1966 diary. Much of the shared information only came to light since around 2006. Researchers have failed to acknowledge that human memory is prone to errors. No government employees have come forward to say they were involved in a cover up of the incident. Even the legendary US researcher, James E McDonald, following a personal investigation of Westall, failed to promote it as an excellent example of UAP. You cannot retain a long term interest in any topic, without thinking that the subject of your study has some merit. I am still not convinced that the phenomenon has a simple explanation, such the extra-terrestrial hypothesis. In conclusion, after 50 years of research, I still believe that the phenomenon contains genuine mystery, worthy of continued scientific study. Update as at 31 December 2017. As I practice what I preach, despite all the recent news re a formerly secret Pentagon study, I am taking an indefinite break from UFO research. I expect to return at some future date, refreshed and full of new ideas. Till then, bye. On a personal level. I have for many years spoken of the need to secure original source material, and to follow the data wherever the end results lead. Many years ago, I foresaw the need to move from large, formal organisations to either work alone, or in a small team, and made this move. Today, I work by networking, across the globe. Regarding high strangeness reports. I have indeed come across, documented, and published, (e.g. in the MUFON Journal; International UFO Reporter) such accounts. I have worked with numerous individuals over time, to examine their highly personal experiences. This is long before the establishment of this blog in 2009, and why some blog readers might easily gain the impression that I have never studied these type of accounts. As a number of chapter authors indicate, exploring high strangeness reports takes time, and can be exhausting, both for experiencers and investigators. My own opinion, for what it is worth, is that I agree with the chapter authors who urge us to study high strangeness reports, and document what they tell us. However, I also urge both investigators and experiencers to become familiar with current research on such topics as memory processes; the fantasy-prone personality; sleep paralysis; hypnagogic imagery, fugue states, and other similar psychological and physiological processes. For, just as 95% of incoming raw sightings turn out to have mundane explanations after intelligent investigation and analysis, I personally find that some high strangeness reports do indeed have explanations which lie in psychological processes. I believe that at the moment, this fact is insufficiently acknowledged, by both researchers and experiencers. All in all, this book is an extremely welcome addition to the UAP literature. I would recommend it highly to anyone who has a serious interest in our mutual topic. 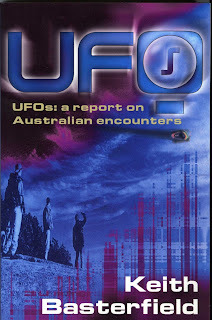 I was asked recently for a listing of UFO books by Australian authors. So, here it is. If any blog readers know of others, I would appreciate an email to keithbasterfield@yahoo.com.au in order that I may amend this list. Images are courtesy of Amazon Books, unless otherwise credited. 1965. "Flying Saucers Over Australia." James Holledge. 1967. "Flying Saucers Where Do They Come From?" Richard Tambling. 1969. "UFOs over the Southern Hemisphere." 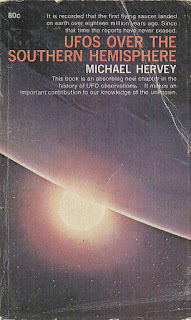 Michael Hervey. 1976. "UFOs: The American Scene." Michael Hervey. 1978. "UFOs: A Scientific Enigma." David Seargent. 1981. "UFOs: The Image Hypothesis." Keith Basterfield. 1983. "UFOs: The Case for Scientific Myopia." Stan Seers. 1996. "The Oz Files." Bill Chalker. 1996. "The Cosmic Conspiracy." Stan Deyo. 1996. "The Gosford Files." Bryan Dickeson and Moira McGhee. 1997. 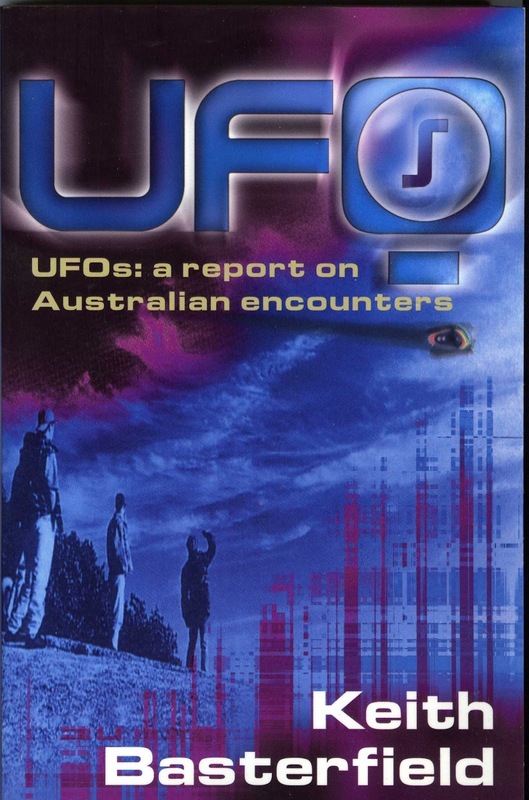 "UFOs: A Report on Australian Encounters." Keith Basterfield. 2004. "Australian UFOs:Through the Window of Time." Heather Gilroy and Rex Gilroy. 2005. "Hair of the Alien." Bill Chalker. 2007 "Blue Mountains Triangle - Secret Underground Australian/American Bases and the ET Connection. Heather Gilroy and Rex Gilroy. 2007. "UFO Down-Under." Barry Taylor. 2011. "UFO History Keys." Bill Chalker. 2011. "The UFO Diaries." Martin Plowman. 2011. "Tasmania: A UFO History." Keith Roberts. 2012. "Roswell Revealed." Sunrise Information Services. 2012 "My Awakening Part 1." Peter Slattery. 2012. "My Awakening Part 2." Peter Slattery. 2012. "The History of Man." Peter Slattery. 2013 "The Energy beings - ET Abductions from Beyond Time." Heather Gilroy and Rex Gilroy. 2013. "Can UFOs Advance Science?" Sunrise Information Services. 2013. "Operation Starseed." Peter Slattery. 2014. "The Book of Shi-Ji." Peter Slattery. 2014. "The ET Contact Experience." Peter Slattery. 2014. "Breaking Free." Peter Slattery. 2016. "Alien Cobweb-the ET 'Mudhead' Mystery and the "Gympie Triangle." Heather Gilroy and Rex Gilroy. 2016. "Contact Down Under." Moira McGhee. 2016. "The New Human." Mary Rodwell. 2016. "Connect to your spirit/ET guide." Peter Slattery. 2017. "UFOs Down Under." Barry Watts. 2017. "The Alien Gene." Moira McGhee. 2017. "The Book of Shi-Ji 2." Peter Slattery. At about 9:00 am. 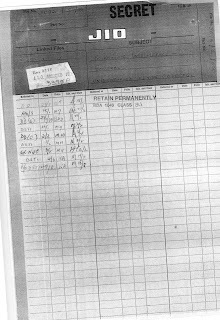 local time, on 19 January, 1966, banana grower, George Pedley, aged 28, was driving a tractor about one half mile from a farm house owned by Albert Pennisi. Pedley's attention was drawn by a 'hissing' sound, clearly heard over the noise from the tractor's engine. He looked about for the source of the noise, and saw an unusual object some 25 yards away. He described it as about 30 feet in the air, rising vertically. Its shape was that of 'two saucers face to face.' It was light grey in color, being dull, non-reflective. Its size was estimated as 25 feet long by eight to nine feet deep. No structured features were visible. The loud 'hissing' noise seemed to diminish as the object rose. It rose to a height of 60 feet, then departed, climbing at about an angle of forty-five degrees, extremely fast, to the South-west. For the duration of his observation, which was only 5-6 seconds, it appeared to be always rotating. The local paper, the 'Tully Times,' carried an account. This was quickly followed by articles in newspapers in the capital cities of Brisbane, Sydney and Melbourne. Recently, researcher and historian Barry Greenwood, of Boston in the USA, visited the archives of the J Allen Hynek Center for UFO Studies, in Chicago. One of the aims of Barry's visit, was to keep an eye out for any Australian material. He found quite a few Australian items, and kindly forwarded me a copy of them. Barry located a number of international newspaper articles, including the following. No doubt this is only a representative sample. 25 January 1966. 'A swish in the swamp - from space!' Lancashire Evening Post. A question arises in my mind, as to why this particular Australian incident should have caused so much international attention? You will notice the frequent use of the word 'nest' in the newspaper headlines. Was it the use of this evocative word 'nest' which intrigued newspaper editors? Does any blog reader know when the word 'nest' was first associated with certain UAP physical trace cases? While gathering together a range of material on the incident for a review of the data, I noted a few initial things. 1. The duration of the visual sighting of the unusual 'object' was much shorter than many people assume from reading the accounts on the Internet. 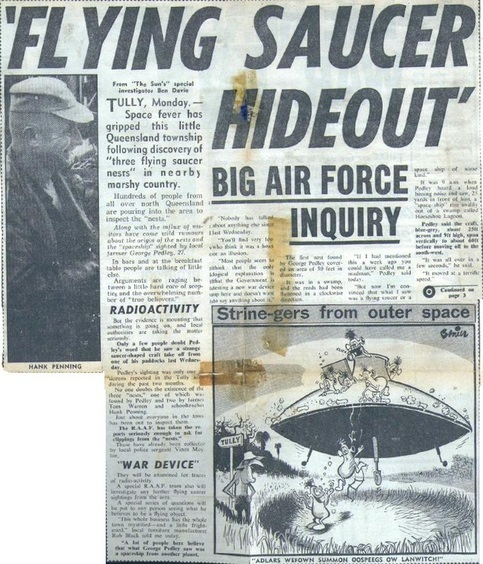 The investigation report published by the Queensland Flying Saucer Research Bureau (now UFO (Research) Queensland, Inc.) gives the duration as only 4-5 seconds. This is a terribly short time for an individual, encountering an unexpected event, to take it all in. 2. There was an article written, at the time, by an anonymous consultant of the Victorian Flying Saucer Research Society. Here we have a consultant who has been connected with studies in atmospheric sciences, suggesting a 50/50% chance of the explanation being a meteorological event. 3. Local newspaper accounts, and indeed local UAP researchers, noted that similar physical traces had been found in Far North Queensland, prior to the Euramo incident, and attributed to natural causes. A search of the UAP literature since 1966, also reveals a large number of other 'nests' had been reported in the area. In short, a rotating, grey. non-structured object, simply disappeared in mid-air after a few seconds of observation, on a calm, sunny morning - conditions suitable for the formation of a rotating atmospheric vortex. The swirled reeds suggested that a rotating force had been applied - again suggestive of a vortex. 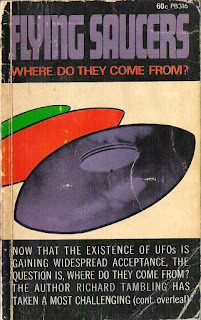 So, I pose the question as to whether or not the Euramo 'object' was a classic 'flying saucer' or something more mundane? 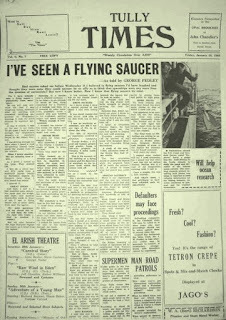 Sydney based researcher Bill Chalker, who has extensively researched the Euramo incident argues for the classic 'flying saucer' interpretation. I am not so sure. I have previously written a number of times about the former Australian Department of Supply and files which it held on UAP; and the 1971 ANZAAS UAP symposium. 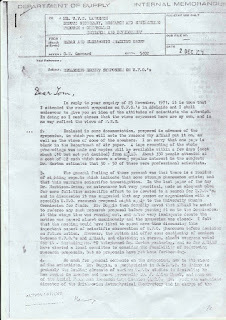 We know from examining previous government files, that there was discussion within the Department of Defence, in May to July 1971, about the RAAF handing over investigation of UAP to the Department of Supply, or at least the Department of Supply taking a look at a limited number of cases per year from a scientific perspective. (For example NAA files series A703 control symbol 554/1/1/30 Part 2, p.164.) What we have never found out is, what area within the Department of Supply had expressed this interest? Does a December 1971 internal Department of Supply memo give us a clue? 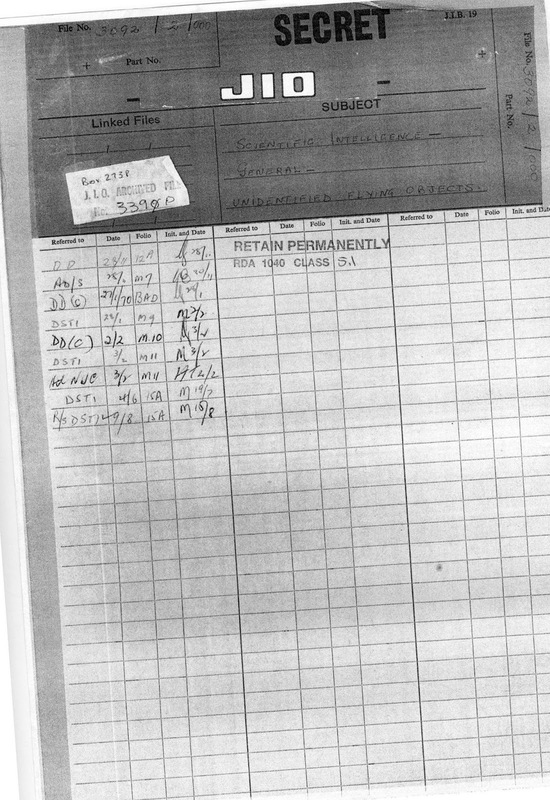 Sydney researcher Bill Chalker, included images of an internal Department of Supply memo, on his blog, which was of great interest to me. In view of this interest, I have transcribed the text of the memo below. I will then provide some comments about the contents, and the broader context. 'In reply to your enquiry of 25 November 1971, it is true that I attended the recent symposium on UFOs in Adelaide and I shall endeavour to give you an idea of the attitudes of scientists who attended. In doing so I must stress that the views expressed here are my own, and in no way reflect the views of W.R.E. 2. Enclosed is some documentation prepared in advance of the symposium , in which you will note the reasons why ANZAAS put it on, as well as the views of some of the speakers. I am sorry that one page is blank in the Department of Air paper. A tape recording of the whole proceedings was made and copies will be available within a few days (cost about $10 but not yet decided) from ANZAAS. About 350 people attended at a cost of $2 each which shows a strong popular interest in the subject; Dr Horton estimates that 30-50 of these were professional scientists. 3. The general feeling of those present was that there is a residue of sighting reports which indicate that some strange phenomenon exists; and that this warrants scientific investigation. In the last paper of the day Dr Herbison-Evans, an astronomer but very practical, made an eloquent plea for some full-time scientific effort to be devoted to a search for UFOs and in discussion it was suggested that any person or organisation with a specific UFO research proposal might apply to the University Grants commission for funds. Dr Duggin then formally moved that ANZAAS be asked to referee any such research proposal before referring it on to the commission. At this stage time was running out, and after very inadequate debate the motion was passed almost unanimously and the symposium was closed. I felt that the meeting would have liked to spend more time discussing this important aspect of scientific observation of UFO phenomena before deciding on future action. However, the motion did offer some continuity of contact between UFOs and ANZAAS and clutching at straws, almost everyone voted for it - including me. I telephoned Dr Horton yesterday, and so far ANZAAS have elected a local committee o consider the feasibility of refereeing research proposals, but no proposals have yet been forthcoming. 4. So much for general comments on the symposium, now to the views of the scientists. 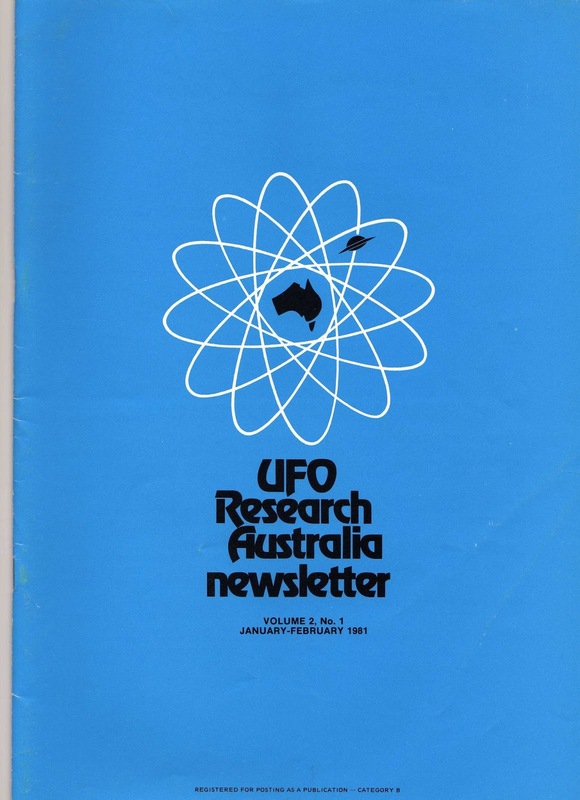 Dr Duggin, a geophysicist in CSIRO in Sydney is probably the leading advocate of serious UFO studies in Australia; he has worked in America and knows personally DR J Allen Hynek, and members of the Aerial Phenomena Research Organisation (APRO.) Dr Hynek was associate director of the Smithsonian Astrophysical Observatory and in charge of the Baker-Nunn satellite tracking program when I was at Island Lagoon, and he is now Professor of Astronomy at NorthWestern University, Evanston, Illinois. He was involved in one of the official American investigations into UFOs, and I believe is now pressing for some sort of review of the Condon report. The Adelaide symposium received American press coverage as a result of Dr Duggin's contact with APRO whose representative then telephoned Dr Horton and obtained permission to "put on the press wires" a report of the symposium. A letter in the Australian, 19 November 1971, p12 headed "Bizarre" indicating that the symposium was reported in America. 5. In endeavouring to answer your question about the views of the scientists, I must point out that we had insufficient discussion for me to learn what was the true views of the majority, and that I am expressing what I believe to be the majority view, based upon those who spoke publicly or to me privately. Certainly they believe that it is possible and reasonable that we could receive visitors from another world either now or some other time past or present. Our scientific knowledge of the solar system and more distant systems is so meagre that we cannot estimate a meaningful probability of extraterrestrial visitors, and therefore we must rely on objective observations. The scientists accept that there is a residue of unexplained sightings and that something should be done to try and explain them. At this point we seem to bog down on the three aspects, viz - why should we investigate; what should we investigate, and how should we investigate? It is significant that no-one has yet seriously put up a research programme - although Dr Herbison-Evans did make some practical suggestions for using cameras and magnetic counters. Dr Horton says that three of the staff of the Physics department would like to see some UFO research done, but have not yet been able to formulate a programme. 6. My own view is as given above as one of the majority of scientists, but I do not advise a deliberate search for UFOs. It would be like trying to make objective measurement of fireballs or ESP; case are so rare that the job would be frustrating and very expensive, if not abortive. 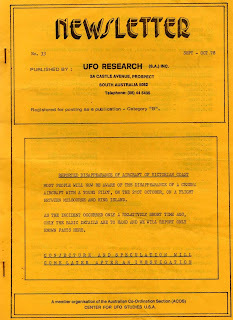 It is interesting to note that we do not have a pressure group urging action on these topics for the sake of the advancement of science, and it is pretty clear that it is only the excitement of the possible discovery of an extra terrestrial civilisation that is the reason for interest in UFOs, since people now recognise such a possibility, any slight evidence such as is offered by UFOs is seized upon as important. Nobody appears to be concerned about UFOs as a threat, and very few are truly concerned to solve the reported sightings for the sake of pure science, so the answers to my previous questions as to what and why we shall investigate seem to be that we want to know whether there is intelligent life elsewhere in the universe, simply because we are very interested and we hope there is. How we do this is not clear, but I think the official Australian investigation should not be as biased as the department of Air effort appears to be, and I would like to see that effort assisted by more scientists to make careful analyses and correlations of existing reports, looking for similarities which might suggest intelligent control, or purpose, or method of propulsion or communication. It is probable that more detailed questions in future cases also would be profitable, especially if done by a keen scientist. If such a review of existing data could be made, that would indicate the desirability or otherwise of further work. Otherwise I believe we must await the results of American or Russian interplanetary missions to other planets in search of life, or for the "visitors" to exhibit themselves to us either deliberately, or by accidentally crashing one of their "saucers." 7. I seem to have been rather long-winded but I hope the message is clear that we keep an open mind on UFOs and would like to see some scientific effort devoted to the investigations of UFO sightings, because it may throw some light on the exciting possibility of extra-terrestrial intelligence. 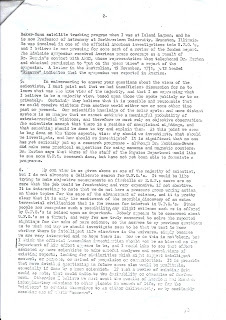 In summary, here we have a December 1971 internal Department of Supply memorandum making some very intelligent comments about the need for scientific study of UFOs. a. National Archives of Australia (NAA) file series D174, control symbol SA 5281 titled 'Unusual occurrences flying saucers at Woomera.' 1952-1955, originating with the Long Range Weapons Establishment. 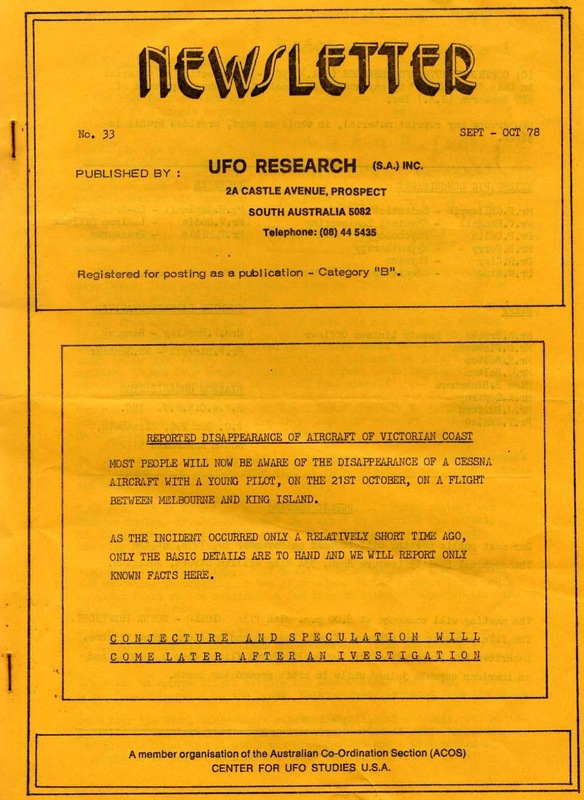 c. NAA file series control symbol SA5644/2/1 titled "Sighting of unidentified flying objects.' 1966-1974, originating with the WRE. A copy of the December 1971 memo above, was not found on any of these three files. 2. A check of the National Archives of Australia's RecordSearch using the keywords 'Radar and electronic tracking group' revealed files, in the file series D891 (WRE Salisbury) with control symbols between N74/1855 and N74/1862. None were open, and each seemed to be a photograph only. I found nothing using the keywords 'Research and engineering.' However, there are literally thousands of not yet examined files about the Department of Supply, Woomera, missile testing etc etc. 3. 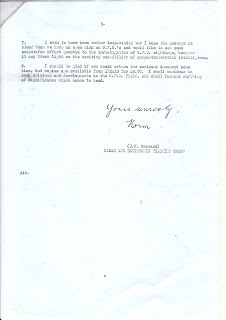 C N(orm) Gerrard was in the Department of Supply's Radar and Electronic Tracking Group, and states his intention to 'continue to seek opinions and developments in the UFO field, and shall forward anything of significance which comes to hand.' 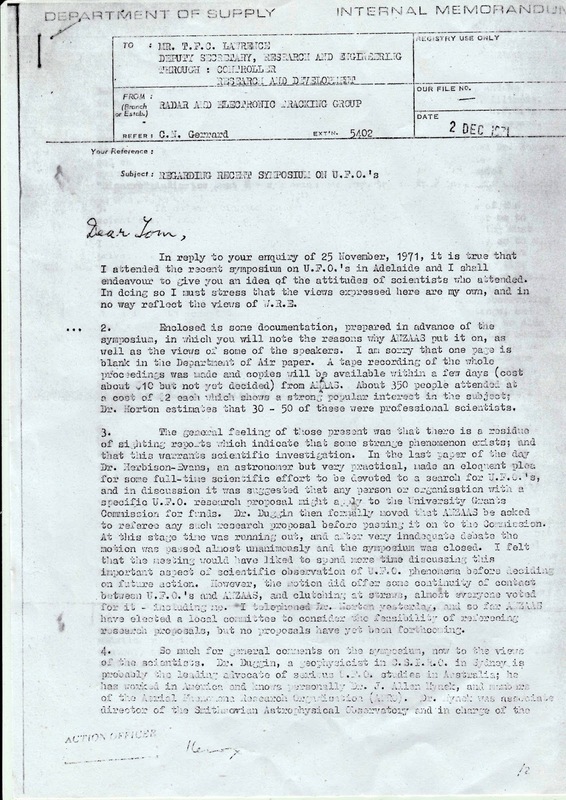 His memo was sent to Mr T F C Lawrence, Deputy Secretary, Research and Engineering, Department of Supply. Perhaps this area was the one which had expressed an interest to the Department of Defence? Have any blog readers thoughts on this? From time to time, people ask me why I don't get excited about the latest UAP video, photograph or sighting? In terms of sightings, long term blog readers will recall that Melbourne researcher, Paul Dean, and I collected Australian sightings over a period of a year, and analysed the best of them. The truth was that very many of them had mundane explanations, often buried in the way the material was breathlessly presented, e.g. 'video of the century!' Very few of these sightings still looked interesting after a critical review of the information. Despite this, I continue to review a range of sources, keeping an eye out for interesting material, looking for the small residue which reflect the 'core' UAP, i.e. sightings which do not have a ready explanation after an intelligent review. My most recent look, in August 2017, at such raw sightings was from a resident of Torquay, Victoria. This individual had a number of sightings, including an oval object, one quarter the size of the full moon in broad daylight; and one where four objects were travelling in formation, again in broad daylight. However, the bottom line was that none were viewed at close range, which would have precluded the possibility of an known object being the stimulus. The same applies to videos. Sydney researcher, Anthony Clarke of UFO Research (NSW) Inc., and I have just spent time looking into a video taken in Sydney at around 7am on 8 August 2017. 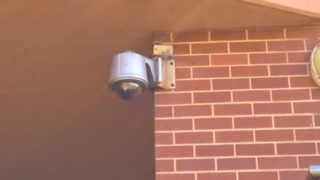 The surveillance video shows what at first glance looks like a very unusual object travelling across a fixed outdoor view, for about a minute. 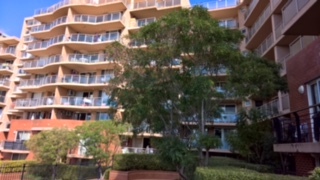 However, after Anthony Clarke visited the location; interviewed the person who discovered the image on the video; took a look at the position of the camera and its housing; he found that a very different picture emerged. 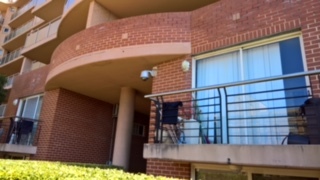 The most likely explanation is that an insect crawled across the exterior of the camera cover, and its de-focused image is what was at first glance taken to be a UAP. Indeed, Anthony noted spiders web near the camera. To read Anthony's investigation report, click here. Still images are frequently submitted to a range of social media sources, and main stream media outlets. A person uploads a photograph, rarely providing any real data that would assist in its analysis; and then frequently fails to respond to inquiries for more information. All, in all, almost all such images are suspect as misidentifications or hoaxes. In recent times, I have identified 'sun dogs;' internal lens reflections, and out of focus birds and insects, in images sent directly to me. Where are the good cases? Further to my earlier blog posts about Dr Michael J Duggin's contribution to Australian UAP research, I have now located a summary of a 1971 talk he gave. Courtesy of Peter Horne, of Adelaide, I now have a copy of the 'Condensed Papers' from the Symposium. only contain a summary of the talk, which I present below. 'There is an exceedingly large body of reports of Unidentified Flying Objects (UFOs) from all over the world. Preliminary investigations show that about 67% of these are due to natural phenomena and so they are classed as Identified Flying Objects (IFOs.) The remainder, even discounting doubtful cases, forms an impressive collection of data. People making reports are usually sincere, often technically qualified and generally shy of the publicity which their sighting causes. The vast number of unexplained reports, which show a surprising degree of internal consistency, argues for serious study of the UFO problem at this time. One problem confronting any would be researcher is the logistics of investigation, cataloguing and analysis of screened reports. Another problem lies in the fact that probably the number of UFO sightings far exceeds the number of UFO reports, as people are reluctant to report this sort of phenomenon, for fear of ridicule. Yet another problem is the ridicule which any interested scientist must face from his professional colleagues. 1. I don't know where Duggin obtained his figure of 67% IFOs from. Most researchers would say that around 90-95% of all incoming raw reports can be explained in mundane terms. that only twelve days before the ANZAAS Symposium, that Duggin was in the USA and visited Vallee on that day. Vallee states that he showed Duggin his (Vallee's) catalogue of landing type reports. Vallee also wrote that Duggin '...has just completed a tour of the US during which he met the leaders of both NICAP and APRO.' This may well explain his comment regarding scientists and UFO societies.